In order to reduce east-west traffic congestion on surrounding routes, Phase II of this $47 million project extended West Dowling Road to Minnesota Drive at the Raspberry Road interchange. Phase II primarily consisted of construction of a bridge structure and embankments, preparation of the roadway, and installation of a noise wall along Raspberry Road. To ensure quality and to meet the needs of the public through 2035, an analysis was performed on intersection design alternatives based on projected annual daily traffic charts. The extension is the final piece of a complex, multiphased, multi-modal project to improve east-west connectivity across Anchorage. Additionally, the project will improve the bicycle and pedestrian facilities in the area, providing access to nearby trails. A portion of the project required that West Dowling Road span over the new Howard Holton Drive below, ensuring that local businesses still had access to the area. During the design process, it was determined the new alignment of the West Dowling Road Extension Phase II would require large fills of over 40’ to match the grade of the required bridge over the Alaska Railroad and Arctic Boulevard. These fills would separate the industrial park on the west of the project from the major arterial of Arctic Boulevard to the east of the project. In order to avoid limiting the businesses to a circuitous route to an arterial a mile to the north, a tunnel connecting Electron Drive to Arctic Boulevard via Howard Holton Court was included in the design. 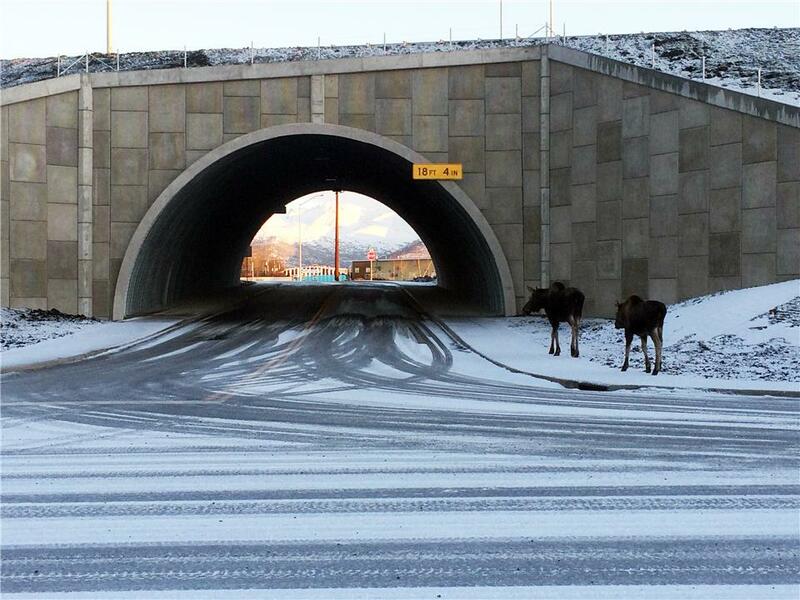 The companies that benefited from the tunnel were the NAPA parts distribution warehouse, Alaska Steel Company, The Dome (the largest free standing inflated sports structure in the state), and the newly constructed CEA Power plant. As the best solution, a 50'-1" x 27' BridgeCor® Structural Plate, 155' in length, was selected and installed. The BridgeCor structure from Contech Engineered Solutions was more cost effective than a traditional girder bridge. Its ease of installation was a plus on the curved, super elevated road over the structure. The designers chose a culvert type bridge over a girder type bridge for economic reasons, due to the limited span required to cross Howard Holtan Court. 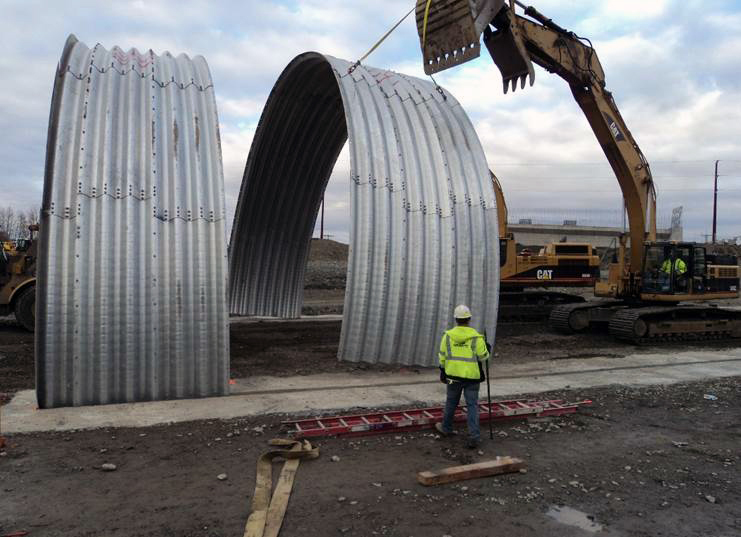 The winning contractor had options as to what type of steel structural plate culvert system would be utilized, provided it was vetted by the design engineer team. The Alaska Department of Transportation and Public Facilities' (AKDOT&PF) contractor, Granite Construction Company, chose the Contech system. BridgeCor enhances the established performance of 6" x 2" MULTIPLATE® by offering nine times the stiffness and three times the strength. Not only is BridgeCor economical and easily assembled, but its bolted, segmental construction is manufactured with the industry's best equipment allowing for the longest laying length sheets in the industry. The structure was pre-assembled in 14 - 12' long sections at the Contech's Anchorage pipe plant and then delivered to the site, where assembly was completed. Pre-assembly reduced on-site assembly and bolting by 75 percent, and match marking was utilized on-site for quicker assembly. It was estimated that over 200,000 tons of backfill was utilized on this project. Also utilized on the project was 1,220' of 18-36" Corrugated Metal Pipe (CMP) and 10 and 14 gauge Bridge Plank for drainage purposes, Stay in Place Deck Form on the Steel Girder Bridge over Arctic Boulevard, and 17,000 square feet of Mechanically Stabilized Earth Wall. For the wall, Contech partnered with the Reinforced Earth Company (RECO) to provide a complete system to the contractor. The RECO system is a MSE wall that features steel reinforced concrete panels and inextensible (steel) reinforcement. Since the select backfill requirements are common to the wall and structure, the construction process is seamless, making this an ideal end treatment option. Mike Gault, Project Engineer with the AKDOT&PF noted the following advantages of the BridgeCor system: "1. Contech had a facility in Anchorage reasonably close to the project limits, 2. The BridgeCor system allowed for a bid for the steel structural plate culvert item to be $1,162,500 less than the design engineer’s estimate, 3. Contech was able to work in conjunction with the MSE system's manufacturer to marry the needs of the walls and the structure, 4. After construction, the BridgeCor structure provided a vertical clearance envelope of 18’-4” where the minimum criteria given was at 16'-6”, 5. The design of the BridgeCor system had the ability to be modified in order to include a concrete portal, enhancing the aesthetics of the structure. Overall, we are quite pleased with the product to date."